If you’re looking for move in ready and unique...then this is the home for you! This two story, four bedroom 2.5 bathroom home is 2,121 square feet of beauty from the outside in and located on a large lot in the sought after Sarival Village subdivision. You’ll be welcomed by warm and inviting rust colored stained concrete floors accentuated by fresh blue-grey interior paint. Imagine celebrating the season in your new kitchen complete with lots of cherry stained maple cabinets, a huge pantry and overlooks the spacious family room. You won’t be able to resist the upstairs grand master is split with three additional bedrooms, bathroom and loft. Upstairs walkways are a warm cherry colored laminate. The fully landscaped background is perfect space for entertaining with room to add a pool or children's play area. This home is a must-see! 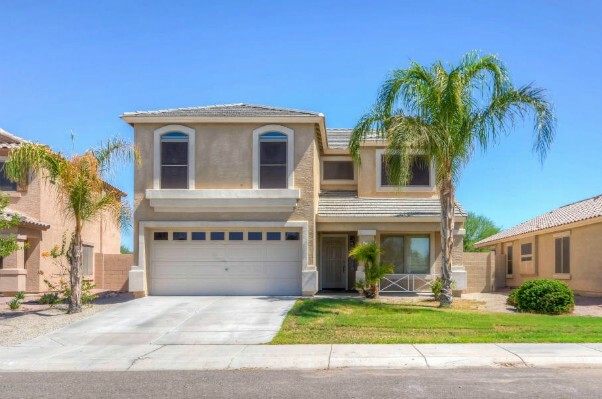 Contact me today to schedule an appointment to view this move-in ready Goodyear home for salelocated at 2793 S 161ST DR, Goodyear, AZ 85338. You could be calling this your home for the holidays!